On the 31st of December, after a twenty-eight year association with Children in Distress, Alisdair Barron will retire as the Charity’s Chief Executive and pass responsibilities to Valentina Zaharia currently the Executive Director of Copii in Dificultate. 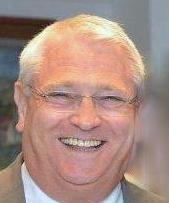 Throughout his time with CID, Alisdair has been at the forefront of “making a better today for children who may have not tomorrow”; initially as a donor, then child and charity sponsor, volunteer, Secretary to the Board of Trustees, a Trustee, and Chair of Trustees and for the last sixteen or so years as Chief Executive. In that period under his direction, the charity has grown from directly caring, in St Laurence Hospice, Cernavoda, for forty or so infants and children living with HIV, to a multi-site children’s care service providing palliative, respite and end of life care in three residential hospices. It has developed pioneering lifeline multiple therapy child development services and introduced innovation education, welfare and support services that have changed the lives and futures of hundreds or perhaps thousands of others. Alisdair is perhaps proudest that together the CID family have introduced quality paediatric hospice care in Romania and having changed legislation, introduced treatment, education and care standards, ensuring a better future for Romanian children and young people living on the autistic disorder spectrum. He shares freely his privilege and pleasure at having “worked with so many wonderful people, supporters and volunteers, who have given freely to help children across the Balkans, but particularly in Romania”. “I am pleased and proud to consider as friends, icons, like Edward Errington. Roy Wheeler and Trish and the late Geoff Witcomb all of whom have achieved wonderful things”. Alisdair is constantly humbled by the goodwill and hard work of donors, whose donations, gifts and legacies have made the charity’s work possible and who have helped, crafted and clothe tens of thousands of children and senior citizens for that matter with warm winter knits. “I know too many people to mention individually, however particularly thank Paul Kubaszky, Sir Neil and Lady Sheila Thorne and Canon Chris Samuels for their consistently sound advice, friendship and support”. Although he had resigned in March, he was persuaded retire on his 69th birthday in November. He is grateful, that the Trustees acknowledge the suggested synergistic benefits of ever closer co-operation between the charity and its operating partner CID Ro. Alisdair has every confidence in the expertise and abilities of Valentina Zaharia, who is well known, highly regarded and respected for her professionalism, expertise, commitment and devotion to the children in her care.